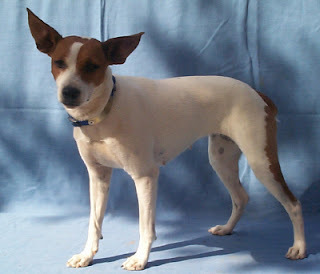 The Rat Terrier originates from Britain and was created by the crossbreeding of the smooth fox terrier and Manchester terrier in the early part of the 18th century. They were also brought to the U.S. in 1820s and towards the latter part of the 18th century, where they became more popular and famous. These breeds of dogs are stubborn and willful and some times they are reserved around strangers, but get along with them quickly. this breed is bold, brave and fearless and is not recommended for the average family, because they are very dominant and are better suited for single person home. This breed makes good watchdogs, as they are alert, energetic and lively they require early socialization and obedience training, as they have the tendency to snap if frightened, this breed mingles well with other pets, but need to socialize. The rat terrier has a single and short coat, which is close to the body, and they don’t need much effort, regarding their grooming, but they should be protected from cold weather. This breed of dog are not easy to train, since they require an experienced trainer and will not respond to the harsh and hard methods of training. Training should be given to them with fairness and patience. This breed is better suited to small yards, they also love to go to long walks and enjoy play session with the master, they require regular 40 minutes exercise to remain fit. The Rat terrier does not require attention in grooming areas, however, a good brushing can be given to them, in order to avoid dirt and dead hair bathing should be given when it requires. The Rat Terrier is prone to have skin problems, so it is important to protect them from cold climates and water, physically short and so their bodies, tend to get very cold easily.